" I think I want to talk a little bit about who we are. Because see reality is based upon our perception of reality. It’s what it is. But we really need to understand that see, and I think one of the objectives in life is to understand. It’s not enough to know, right? I know how to turn on the TV but I can’t even begin to understand how it works. So it’s not enough to know. So I think one of the purposes that life teaches us is, the further we make it into life, the more coherency we have left and we will understand. Sometimes I feel like I’m in a reality where I’m surrounded by all these beings that don’t know who they are. They don’t know who they are. And because they don’t know who they are, they don’t know where they are, they don’t understand the language that they speak, so there’s a general confusion and chaos that just takes place in their reality. It’s almost like, you know, the way they make all the little chaos go on inside of an internal combustion engine, you know, and all the sparks and all the stuff that’s flying it makes, it creates an energy that runs something. Well anyway, it’s almost like this is the perceptional reality that is being carried around in the human consciousness. So anyway, who we are. We’re human beings. And the DNA of the human being – my bone, flesh, and blood is literally made up of the metals, minerals, and liquids of the Earth. We are literally shapes and forms of the Earth. That’s who we are. And we have being. Our being comes from our relationship to the Sun, and to the universe. Because our relationship to the Sun – I mean let’s be, you know, be very coherent and clear about this: without the Sun we would not have life. Alright, it’s almost like the rays of light that the Sun represents and brings to the Earth, see, this is the sperm that gives life to the womb that the Earth is. So our relationship to power and our relationship to the reality of power is connected to that relationship. Anyway, what I see, the human, the being part of human is being mined through the human experience. See they’re mining us." 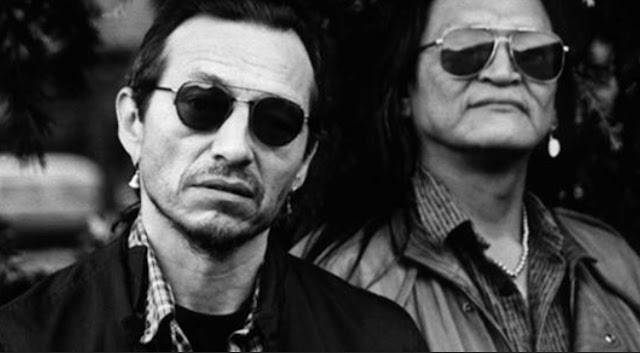 Responses to "John Trudell: What It Means To Be A Spiritual Being "
Interesting. I would be curious to know what he's added to this in the last 10-12 yrs, because I'm sure he has. I wish he could tell us but sadly he has moved on to other horizons.